The heart receives life-giving blood from vessels called coronary arteries. If these arteries become partially blocked or narrowed by the accumulation of fatty materials, the heart may not receive the blood it needs to function properly. This narrowing of coronary arteries is called coronary atherosclerosis or, more commonly, coronary artery disease (CAD). As CAD progresses, the heart muscle may not receive enough blood when under stress (for example, when exercising). This often results in chest pain called angina pectoris. However, there may be no other outward physical signs of the disease. If CAD is limiting blood flow to a part of your heart, the nuclear stress exam can be very useful in detecting the presence and significance of CAD. This test will take 3-4 hours to complete. HOW IS CORONARY ARTERY DISEASE (CAD) DIAGNOSED? There are three types of procedures that can be used for this test. Your cardiologist will determine which one you should take. Initially, your health care provider will inject you with a non-harmful radioactive substance and take pictures of your heart under resting conditions. This substance is taken up by your heart muscle and shows how well the different areas of the heart are getting blood flow. If there is decreased uptake, that means the blood flow is lacking to that area. 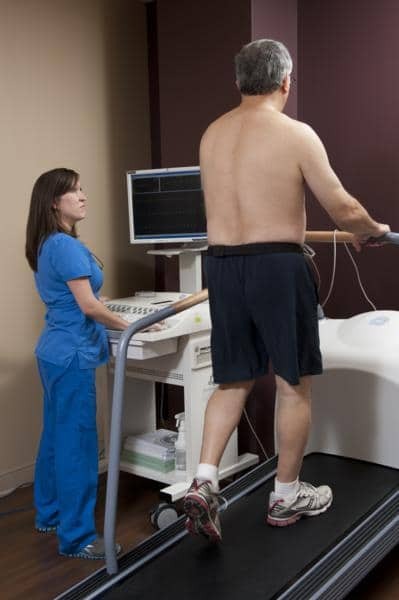 During the second part of the test, you will either exercise on a treadmill or be injected with a medication that causes your heart rate to increase and your arteries to dilate (open up). 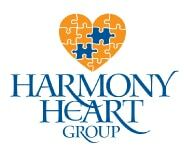 Your heart will be monitored with a continuous EKG tracing. The doctor will look for changes on the EKG that indicate ischemia (decreased blood flow). He/she will also monitor you for any abnormal heart rhythms that may develop with exercise. Next, you will rest for up to a few hours. You will be allowed to have lunch or a snack nearby while you wait for the repeat pictures to be taken. The tracer administered during this stress exam contains a small amount of radioactivity. The amount of radiation you will be exposed to is comparable to that from an x-ray CAT (CT) scan. You will be given this tracer before and during your stress test. Adverse patient reaction to the tracer is rare. You may briefly notice a metallic taste a few seconds after injection has occurred. Other side effects rarely occur. Intravenous Adenosine and LexiScan are drugs designed to dilate your blood vessels. They may cause some side effects. In most cases, these effects subside quickly or can easily be reversed. Some of these effects may be experienced during or immediately after the test, including chest pain, headache, dizziness, changes in heart rate and blood pressure, nausea and flushing. You will be given the tracer before and during your stress test. I.V. Dobutamine is used for asthma patients and is a drug designed to increase the heart rate. Side effects, which may occur, include chest pain, headache, dizziness, changes in heart rate and blood pressure, nausea and flushing, heart pounding and jitteriness. You will be given the tracer before and during your stress test. WHAT SHOULD I DO BEFORE THE TEST? Refrain from eating or drinking 4 to 6 hours prior to the test. This will minimize the possibility of nausea, which may accompany vigorous exercise after eating. In addition, the pictures of your heart are clearer when the stomach is not full. You may be asked to temporarily discontinue certain heart/blood pressure medications prior to the stress exam because some heart medications may interfere with the accuracy and effectiveness of the exam. You may also be asked to abstain from consuming any products containing caffeine, such as coffee or chocolate, for a period of 24 hours before your test. Wear comfortable, loose clothing (sweat pants or shorts and a t-shirt) and footwear appropriate for brisk exercise on a treadmill (a moving belt you walk on). You will work hard during the test and comfortable clothing will make it easier for you.